Zadar, a city of exceptional 3000-year history and an exceptionally valuable cultural heritage, a city that will always offer you something new and completely original. 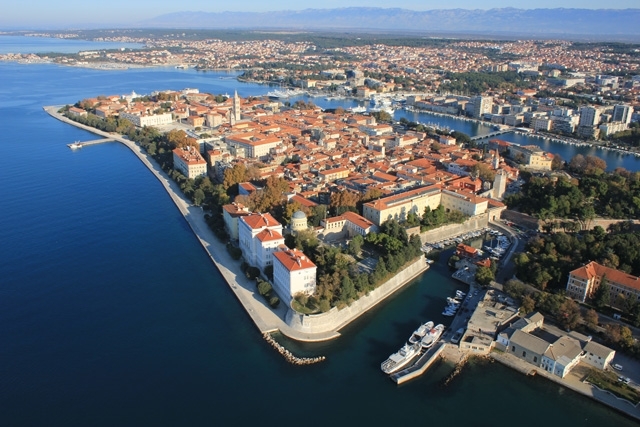 Situated in the very heart of the Adriatic, Zadar is the urban center of Northern Dalmatia as the administrative, economic, cultural and political center of the region where 75,000 inhabitants live. The city of Zadar, combined with the beauty of the past and all the amenities that a modern traveler offers, offers numerous tourist attractions: looking for an ideal accommodation, authentic gourmet delicacies, cultural sights, modern sports facilities and a varied excursion program, you have chosen the right destination for your holiday, sport and entertainment. Zadar is one of the most popular Croatian tourist destinations, which the London Times proclaimed as the "center of fun on the Adriatic," and Guardian "the new Croatian capital of cool". It will conquer you with its special atmosphere and rich life - whether it is day or night. In the summer, Zadar hosts the Musical Evenings in St. Donat, the Zadar Summer Theater, the Contemporary Music Festival, the KalelargArt - Street Art Festival, and the urban Zadar Dream Festival. You will certainly have fun on the Night of Full Tilt, Millennium Jump or at one of the concerts of world music attractions. The heavily indented coastline, the islands and intact nature of the mammals of numerous boaters in this area. The archipelago of 24 bigger and even 300 small small islands and cliffs, 3 nature parks - Telašćica, Velebit and Vransko Lake and 5 national parks - Paklenica, Plitvice, Kornati, Krka and North Velebit rank Zadar and its surroundings at the very top of the tourist offer Croatian. Greetings to the sun and the sea organ certainly belong to the interesting things that must be seen in this old and beautiful city.